Born: September 8, 1888 in Cataumet Ma. 1. Virginia Lee Handy Sheoytz; (June 1, 1920 – April 29, 1972); Married Levi Michael Sheoytz, WW ll (1913 – 1988) (Michael Peter Sheoytz & Olive Lincoln Hamblin) in Bourne Ma. 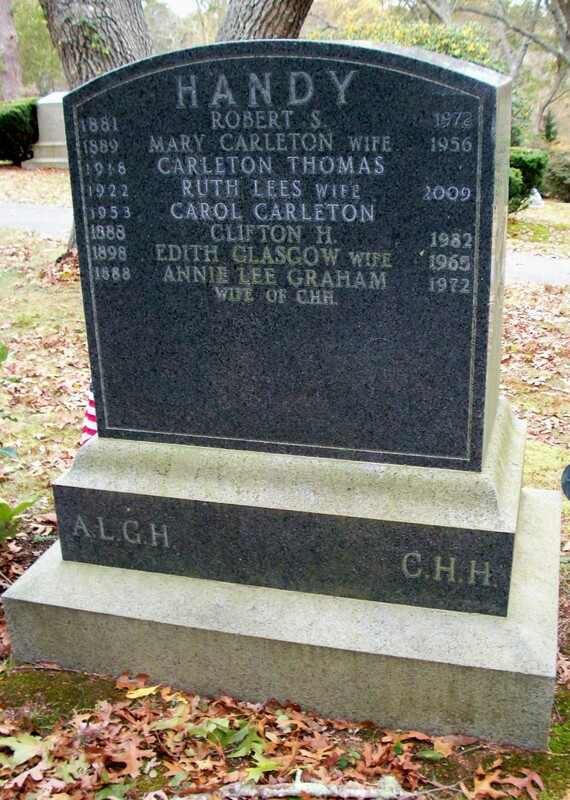 on May 29, 1947; Virginia & her son Drew Clifton Sheoytz are buried in Cataumet Cemetery; Levi is buried in Massachusetts National Cemetery in Bourne Ma..
2. Dorothy Clifton Handy Phillips; (January 2, 1923 – April 4, 1996); Married Frederick Bourne Phillips, WW ll (1913 – 2001) (Alfred C. Phillips & Edna Clifton Bourne) in Muskogee Ok. on April 3, 1943; They had 3 daughters; Dorothy & Frederick are buried in Cataumet Cemetery. 3. Robert Graham Handy, WW ll; (August 24, 1925 – February 27, 2010); Married Marilyn Richmond Wing (1927 – 1991) (Elton Leroy Wing & Caroline A. Mayo); He was a member of Bourne High School Class of 1943; Robert was buried in Massachusetts National Cemetery in Bourne Ma..
4. Philip Dustin Handy, Korea, Vietnam; (November 6, 1928 – June 14, 1995); Philip married Susan Jones (–) (1942 – ?) & died in Charleston S.C.; Philip & Susan are buried in Hillcrest Cemetery in Conway S.C..
5. Arlene Webster Handy Shade Perry Wheeler; (December 31, 1930 – ? ); Married (1) Theodore Shade & married (2) Wallace/Jet Judson Perry, Jr. (1911 – 1979) (Wallace Judson Perry & Lillian May Brink) in Bourne Ma. on December 15, 1967 & married (3) (–) Wheeler.